Buzzstream Review: How Does it Measure Up? 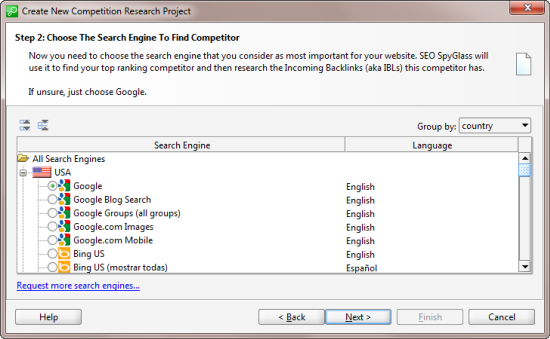 SEO Spyglass is one of the 4 tools Link-Assistant sells (individually) and as a part of their SEO Power Suite. We did a review of their Rank Tracker application a few months ago and we plan to review their other 2 tools in upcoming blog posts. Update: Please note that in spite of us doing free non-affiliate reviews of their software, someone spammed the crap out of our blog promoting this company's tools, which is at best uninspiring. As with most software tools there are features you can and cannot access, or limits you'll hit, depending on the version you choose. You can see the comparison here. Perhaps the biggest feature is their newest feature. They recently launched their own link database, a couple of months early in beta, as the tool had been largely dependent on the now dead Yahoo! Site Explorer. 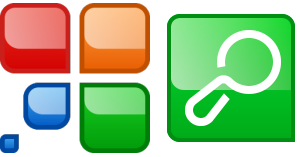 The launch of a third or fourth-ish link database (Majestic SEO, Open Site Explorer, A-Href's rounding out the others) is a win for link researchers. It still needs a bit of work, as we'll discuss below, but hopefully they plan on taking the some of the better features of the other tools and incorporating them into their tool. One of my pet peeves with software is feature bloat which in turn creates a rough user experience. Link-Assistant's tools are incredibly easy to use in my experience. Once you fire up SEO Spyglass you can choose to research links from a competing website or links based off of a keyword. 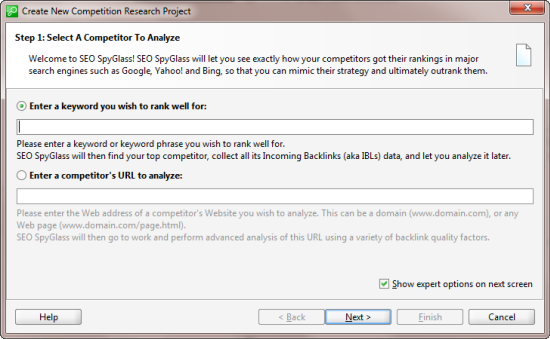 Most of the time I use the competitor's URL when doing link research but SEO Spyglass doubles as a link prospecting tool as well, so here I'll pick a keyword I might want to target "Seo Training". 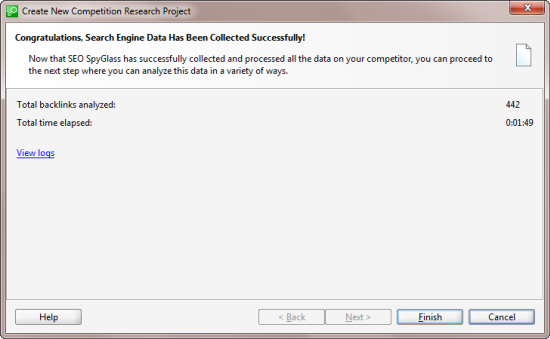 The next screen is where you'll choose the search engine that is most relevant to where you want to compete. They have support for a bunch of different countries and search engines and you can see the break down on their site. So SEO Spyglass will grab the top competitor from your chosen SERP will run multiple link sources off of that site (would love to see some API integration with Majestic and Open Site Explorer here). 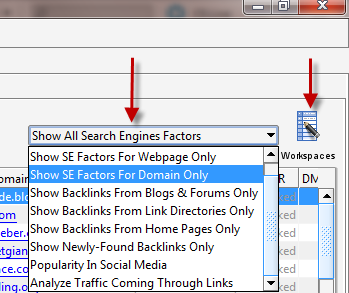 This is where you'll see their own Backlink Explorer for the first time. One way around captchas is to either pay someone to run this tool for you and manually do it, but for large projects that is not ideal as captcha's will pile up and you could get the IP temporarily banned. Link-Assistant offers an Anti-Captcha plan to combat this issue, you can see the pricing here. Spyglass will then ask you if you want to update the factors associated with these links. You can add a ton of social media stuff here including popularity on Facebook, Google +, Page-level Twitter mentions and so on. You can also pick up bookmarking data and various cache dates. Keep in mind that the more you select, especially with stuff like cache date, you are likely to run into captcha's. SEO Spyglass also offers Search Safety Settings (inside of the preferences pane, middle of the left column in the above screenshot) where you can update human emulation settings and proxies to both speed up the application and to help avoid search engine bans. I've used Trusted Proxies with Link-Assistant and they have worked quite well. You can't control the factors globally, you have to do it for each project but you can update Spyglass to only offer you specific backlink sources. I'm going to deselect PageRank here to speed up the project (you can always update later or use other tools for PageRank scrapes). I've blurred out the site information as I see little reason to highlight the site here. 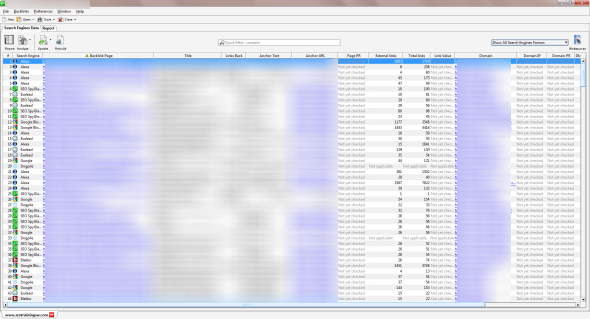 But you can see where the data has populated for the factors I selected. 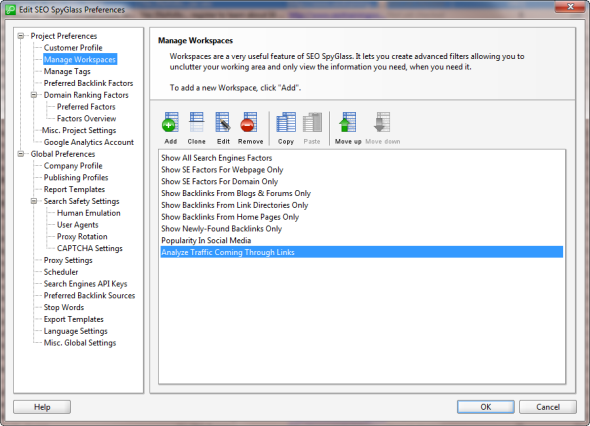 Your filtering options are seen to the left of the workspaces here. It's not full blown filtering and sorting but if you are looking for some quick information on specific link queries, it can be helpful. Most of the data is useful. I think the link value is overvalued a bit based on my experience finding links that often had 0 link value in the tool but clearly benefited the site it ended up linking to. PageRank queries in bulk will cause lots of captcha's and given how out of date PR can be it isn't a metric I typically include on large reports. You can't export from this window but if you just do a control/command-a you can copy and paste to a spreadsheet. 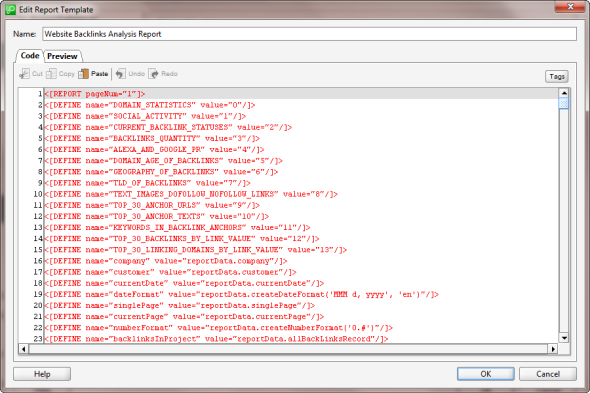 Rebuilding the report is similar to updating except updating doesn't allow you to change the specified search engine. 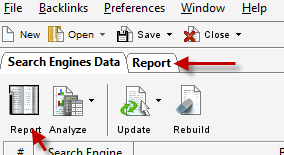 When you Rebuild the report you can select a new search engine. 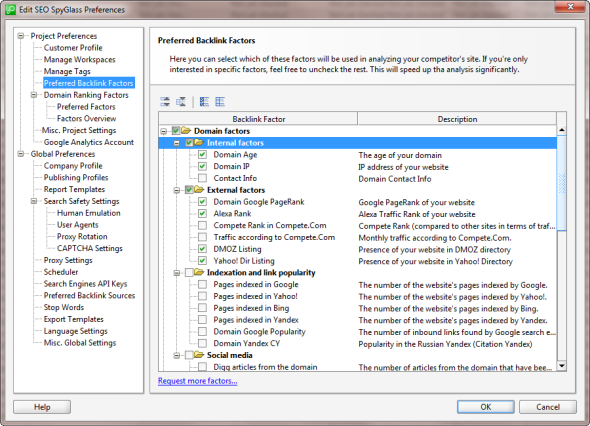 This is helpful when comparing what is ranking in Google versus Bing. 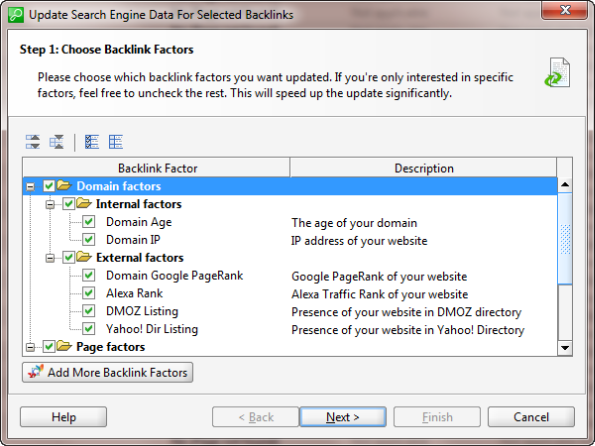 Click Rebuild and update the search engine plus add/remove backlink factors. Top 30 links by "link value"
Top 30 domains by "link value"
Overall the reporting options are solid and offer lots of data. 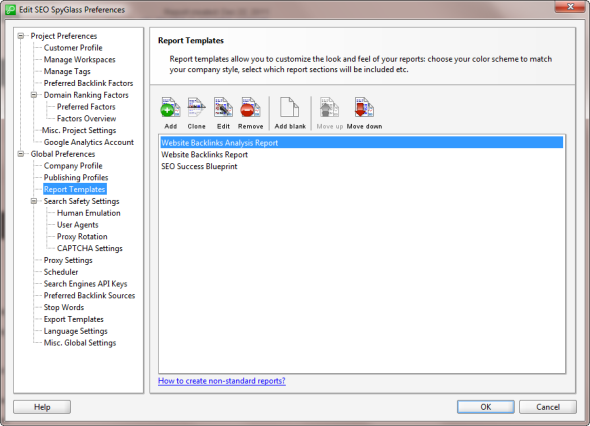 It's a little more work to customize the reports but you do have lots of granular customization options and once they are set up you can save them as global preferences. As with other software tools you can set up scheduled checks and report generation. The process for researching a URL is the same as described above, except you already know the URL rather than having SEO Spyglass find the top competing site for it. 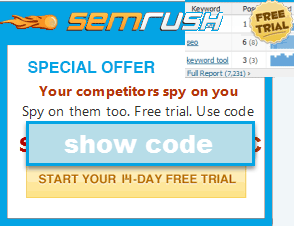 You have the same deep reporting and data options as you do with a keyword search. 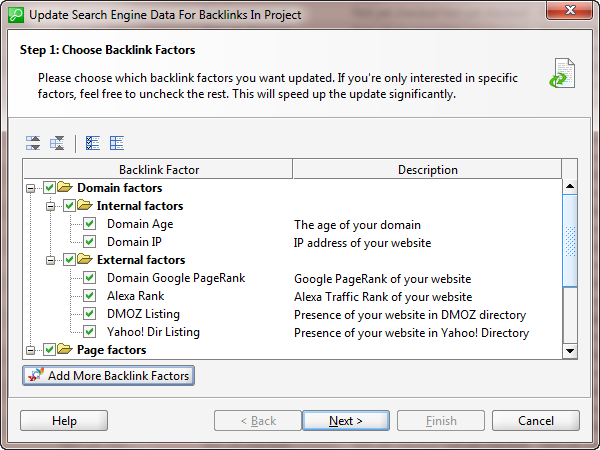 It will be interesting to watch how their database grows because, for now, you can (with the Enterprise version) research an unlimited number of backlinks. Overall, I would recommend trying this tool out. 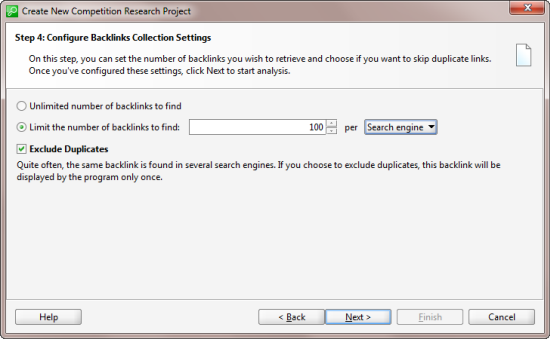 If nothing else, it is another source of backlinks which pulls from other search engines as well (Google, Blekko, Bing, etc). The reporting is good and you have a lot of options with respect to customizing specific link data parameters for your reports. I would like to see more exclusionary options when researching a domain. Like the ability to filter redirects and sub-domain links. It doesn't do much good if we want a quick, competitive report but a quarter or more of the report is from something like a subdomain of the site you are researching. Purchase of a Live Plan required after 6 months to continue using the tool's link research functionality. In running a couple of comparisons against Open Site Explorer and Majestic SEO it was clear that Spyglass has a decent database but needs more filtering options (sub-domains mainly). It's not as robust as OSE or Majestic yet, but it's to be expected. I still found a variety of unique links from its database that I did not see on other tools across the board.